Near the beginning of almost every piece of printed music there are two numbers, one above the other, like a fraction. It’s called a time signature despite its name it tells you very little about time. Instead, it merely indicates how the composer or arranger has grouped the beats to make the music easier to understand. Even so, time is fundamental to music, which makes it different to many other of the arts. You can look at a painting for as little or as long as you want, you can skip through a book or a musical score and get the gist of it. I suppose you can skip through a poem too. But listening to music demands time whether you like it or not. If a symphony lasts forty minutes, you’ll need forty minutes to listen to it. You can’t “fast forward” the music. Well perhaps you could with today’s technology, but it probably wouldn’t make much sense. I’ve noticed that when some famous comedian expires, fellow entertainers like to say that the deceased “had great timing.” Not being a stand-up comic, I am not entirely sure what this means, but I suppose it’s about the speed of delivery and the skill of using pauses for comic effect. Perhaps it’s being aware of the space between the words. There’s a musical connection here, because the French composer Claude Debussy once said that “music is the space between the notes”. Much has been written about this slightly abstruse comment, yet any musician can tell you about the importance of “placing” notes appropriately. Timing, you could say. Before the nineteenth century, composers had no way to indicate the exact speed or tempo of a piece. They could give only a rough indication using words. It wasn’t until 1814 that a “musical chronometer” was invented by Dietrich Nikolaus Winkel of Amsterdam. His idea was borrowed – or possibly stolen – by the German inventor and showman Johann Maelzel who started making metronomes under his own name two years later. From then on, composers had the means of indicating the precise tempo of their music, though at first some didn’t bother. 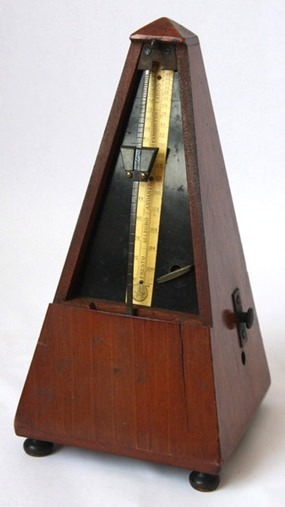 The metronome was – and still is – calibrated in beats per minute, a measurement familiar to DJs of our own time. Few composers have written works inspired by the concept of time, although the French composer Olivier Messiaen wrote Quartet for the End of Time and the British composer Michael Tippett wrote an oratorio called The Mask of Time. John Cage is perhaps best known for his composition entitled 4’33” in which nothing much happens. In contrast, he also wrote a piece for organ called As Slow as Possible which runs for 640 years. It doesn’t get played very often. The Dance of the Hours was actually a ballet within the opera La Gioconda, first performed in 1876. You’ll probably recognise the main tune. If you listen carefully, you might notice that there are more spaces between the notes than there are notes. The ballet represents the hours of the day and night, and it’s intended to symbolize the eternal conflict between the forces of light and darkness. This is a splendid performance by the Korean orchestra with some beautifully timed woodwind solos. The recording has excellent sound and video quality. The title might sound unfamiliar but this is the famous Minute Waltz. Contrary to popular belief, the first word is not pronounced “MINNIT”. It should be pronounced “MY-NEWT” meaning “small”, which of course gives the piece a rather different meaning. It was never intended to be played in one minute, though that hasn’t stopped people from trying. Chopin wrote it in 1847 and got the idea after watching a small dog chasing its tail in the garden. The piece actually lasts for just over two minutes, depending on who plays it. The Ukrainian pianist Valentina Lisitsa manages to scamper through in well under two minutes but to me the faster passages sound a bit of a scramble. Incidentally, the piece is the theme tune of the BBC long-running radio show, Just a Minute, which was first broadcast in 1967 and it’s still going strong. In this rehearsal video, the brilliant Chinese pianist, Lang Lang wears jeans at a woolly jersey instead of his usual concert garb. Just notice how carefully and seemingly instinctively he places the notes in the slower middle section to give a sense of grace and movement. Oh, and in case you’re still wondering about Chopin’s dog, its name was Marquis. Yes, honestly. Next articleWhat Should We Be Worried About?